Just when you thought the 80s were gone and safely encased away in your dusty high school annuals, along came an 80s resurgence in both fashion and culture. 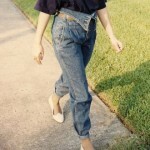 The 80s fashion comeback started in 2006 with the re-introduction of skinny jeans and leggings. Three years later, we are still in the midst of an all-out 80s love-fest, and it feels, well, like totally awesome. So many subtle (and not so subtle) 80s references are creeping into today’s culture that it is hard to keep up. Recently observed examples include pegged jeans on the models of the Spring 2009 J. Crew catalog (see below), J.C. Penny’s nod to “The Breakfast Club” for their back-to-school clothes commercial seen both on TV and at the movies, the return of Knight Rider to TV, and the return of the jelly shoes (I had 3 pair in the 80s!). These references are both fun and respectful. On the other hand, one can cite the use of the extremely cool and timeless Violent Femmes song “Blister in the Sun” in a Wendy’s commercial to hock baked potatoes — really. In recent news, the 80s were very much alive and kickin’ at New York Fashion Week this past week. In fact, Michael Kors featured for his Fall 2009 collection a neon green ensemble that was bright enough to warrant the donning of your vintage Wayfarers (shown right). 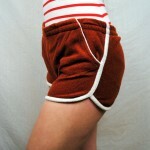 At the online 80s tribute site liketotally80s.com, the most visited sections of the site are the fashion and costume sections. People are clamoring for information, pictures, and how-tos on pulling the 80s look together. One 16-year-old site user entered (and won) the “What would you do for a banana clip?” contest by agreeing to go to her Valentine’s dance at school decked out entirely in 80s party fashions. She has a vintage 80s prom dress and some dyed satin shoes – perfect! Together with 80s bangles and a bodacious 80s up-do in the banana clip, she’ll be a total babe and ready to hit the dance floor and walk like an Egyptian. What is clear is this – the 80s are back. The nostalgia circle runs in 20 year cycles. That was certainly true in the 80s when I thought everything 60s was cool – the music, the clothes, the attitude. We are seeing that with teens today. Suddenly, their 80s-era mom is just a little cooler than she used to be. I mean, she was there when Madonna was just coming on the scene. She had big hair, loud earrings, and shoulder pads that reached for the sky. These were the days before Michael Jackson-esque dance music videos that were like mini-movies, before Kirk Cameron had been left behind, and when it was hard to choose your favorite Corey. Enjoy the 80s while they are back among us! Dig out your parachute pants and strike a pose.